Should Your Child Use a MouthGuard? Sports for kids and adults of any age are a lot of fun, but what if playing your favorite sport caused you or your child to lose a tooth? SW Portland Dentists Dr. Harold Jarvis and Dr. Tiffany Goldwyn at Southwest Portland Dental encourage their patients to consider using a mouthguard while playing a sport that could hurt their smiles. 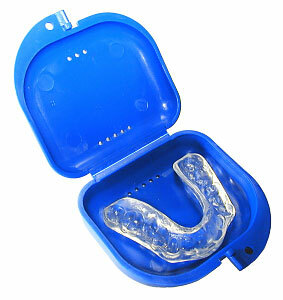 A mouthguard is an essential piece of athletic equipment because it protects teeth and gums. It is a low cost, rubberized piece of sports equipment that, with eat and in the convenience of your kitchen, be customized to fit your child’s mouth. They help protect teeth, gums, cheeks and tongues from injury as a result of contact in sports like basketball, skating, biking, hockey, football and more. Mouthguards are recommended for any sports that pose a threat to your child’s dental health. Which Type of Mouthguard Should My Child Use? All three types of mouthguards provide protection depending on its type. Most of the time, a mouthguard protects only the top teeth as it covers them.. A custom-fitted mouthguard from Southwest Portland Dental can be made specifically for your child based on the sport itself. The most efficient mouthguard should fit properly, be easy to clean, and last a long while. Your child should be able to speak breathe easily and comfortable while using the mouthguard. At Southwest Portland Dental, the dentists and staff recommend that mouthguards be used by your child if there’s a risk of injury to teeth, cheeks, gum tissue or tongue. The the International Academy for Sports Dentistry and the American Dental Association have put together this list of sports where a properly fitted mouthguard would be beneficial. At Southwest Portland Dental, we want our patients to feel safe and secure in any situation, and especially help them to avoid injury. For more information or for answers to your questions regarding whether or not your child should use a mouthguard, call Southwest Portland Dental at 503-244-8112 to schedule an appointment.